We’d love your help. Let us know what’s wrong with this preview of The Last Ten Percent by Michelle McKinney Hammond. 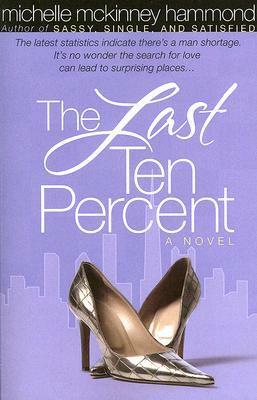 To ask other readers questions about The Last Ten Percent, please sign up. Loved it! Very real, practical and I could so relate to the characters. Great writing! This is a lovely book, very catching title, was curious to know what the 10% was all about, love the story line, its will be very nice if it is actually acted. Talks about a set of friends with the lack of husband syndrome except one who seemed to have it all initially. Adrain, the strongest character and my favorite, i really love that character. Muriel another wonderful character, with strong personality,though holding so much hurt and pain in, she at least knew when to let go and accept love. This is a lovely book, very catching title, was curious to know what the 10% was all about, love the story line, its will be very nice if it is actually acted. I was surprised to see a novel by this author. I started reading and like what? Duh it says it on the cover as well. So far, it seems like an okay read but may skim through to get to the gist of it since I have so many other reads to complete in a couple of days. Unfortunately, I could not get into this book after reading 50 pages. Has nothing to do with her writing per se, just had to keep my interest at this time. (Adrian, I thought was a man the way it is spelled, usually it is spelled as Adri I was surprised to see a novel by this author. I started reading and like what? Duh it says it on the cover as well. So far, it seems like an okay read but may skim through to get to the gist of it since I have so many other reads to complete in a couple of days. Unfortunately, I could not get into this book after reading 50 pages. Has nothing to do with her writing per se, just had to keep my interest at this time. (Adrian, I thought was a man the way it is spelled, usually it is spelled as Adrienne or Adrianne when it is a woman. I found out by page 40+ that it was a woman when she was trying to date a guy named Ron.) This is more relationship based book or chick lit, which I do not read much or like at this time. This book was recommended to me by a college friend who lives in Boston. The book is based in Chicago and covers a lot of "personal issues" that many African American women face with friendships, relationships, careers, and spirituality. It's an easy read. I really like the development of the characters and the book and how relatable they are, but I was very underwhelmed with the ending. It could have at least had a sequel to reveal what happened with the characters. Loved it and would suggest this to ANYONE dealing with any type of personal issues as well as forgiveness. I always think that because the book came out awhile ago I wish I would have read it then, but this book was right on time for my issues in life. I truly enjoyed this read. Practical life issues that are common among all. Michelle did a great job on this novel. a yearly read for me. wonderfully written. loved the characters and this book made me think afterwards! Here's to being true to who I am and not changing 4 anybody!!! Even though this is an contemporary Christian title, it was not preachy. As a chick lit title, I would recommend this book. As a bestselling author, speaker, singer and television co-host, Michelle has authored over 30 books (selling over one million copies worldwide), including best-selling titles The Diva Principle, Sassy, Single and Satisfied, 101 Ways to Get and Keep His Attention, and Secrets of an Irresistible Woman. A gifted vocalist, Michelle has recorded two CD’s, It’s Amazing and Let’s Go In and co-hosted the Emmy Award-winning television talk show Aspiring Women. She has appeared on countless television shows including Bill Maher’s Politically Incorrect, E Channel’s “Soap Talk,” NBC’s The Other Half, The 700 Club, and BET’s Oh Drama! as well as a regular relationship segment on WGN Morning News. She has graced the cover of magazines such as Today’s Christian Woman Precious Times, The Plain Truth and Gospel Today. She has been a contributing writer for Spirit Led Woman, Discipleship Journal and has been featured in articles in Shine, Essence, Ebony, Jet, Black Enterprise Magazine, The Chicago Tribune, The Associated Press and The New York Times. Following several successful years in an award-winning advertising career as an art director/writer/producer (her clients included Coca-Cola USA, McDonald’s, Procter and Gamble, GMC and Ford Motor Company), Michelle suffered a devastating leg injury after being hit by a car. For her the accident was a spiritual turning point, a wake up call to embrace her purpose and fulfill her destiny. These bedridden months gave birth to her first bestseller, “What to Do Until Love Finds You.” Since then Michelle has emerged as a highly-respected author, speaker and singer, reaching a diverse audience nationally and internationally. Crossing denominational lines, addressing secular audiences, as well as addressing men and women from every walk of life, Michelle is known for “keeping it real.” She addresses real-life issues with candor and wit, and the hard questions with sensitivity and empathy. This merits her reputation as a relationship and life empowerment coach, crossing the great divide and sharing keys that lead to reconciliation between the sexes.